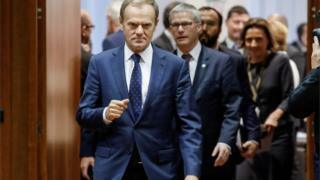 Reports of deadlock over Brexit negotiations may have been exaggerated, European Council President Donald Tusk has said after a Brussels summit. Progress was "not sufficient" to begin trade talks with the UK now but that "doesn't mean there is no progress at all", he said. EU leaders will discuss the issue internally, paving the way for talks with the UK, possibly in December. Theresa May said there was "some way to go" but she was "optimistic". Speaking at the end of a two-day summit, Mr Tusk told reporters: "My impression is that the reports of the deadlock between the EU and the UK have been exaggerated." Reality Check: How are the Brexit talks actually going? Brexit: How do other EU countries see a 'no deal'? The EU's chief Brexit negotiator, Michel Barnier, described the talks as deadlocked earlier this month. Mr Tusk said he was not at odds with Mr Barnier, but his own role was to be a "positive motivator for the next five or six weeks". He said he felt there was "goodwill" on both sides "and this is why I, maybe, in my rhetoric, I'm, maybe, a little bit more optimistic than Michel Barnier, but we are also in a different role". The so-called divorce bill remains a major sticking point in talks with the EU. French President Emmanuel Macron said there was still much work to be done on the financial commitment before trade talks can begin, adding: "We are not halfway there." 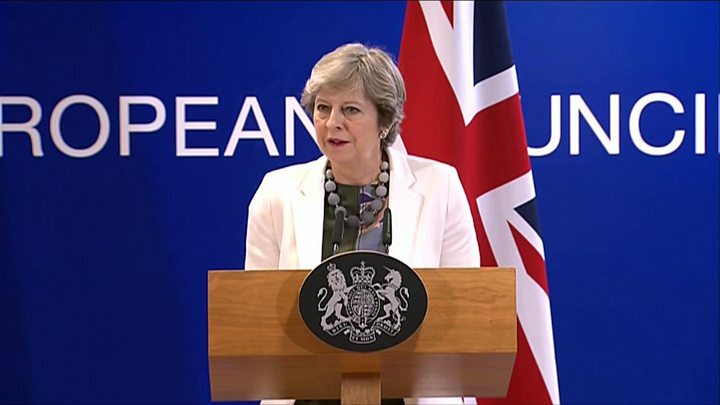 Theresa May declined to say in a press conference after the summit what the UK would be prepared to pay, saying the "final settlement" would come as part of a "final agreement" with the EU. The UK prime minister did not name any figures but refused to deny that she had told other EU leaders the UK could pay many more billions of pounds than the £20bn she had indicated in her Florence speech last month. "I have said that ... we will honour the commitments that we have made during our membership," she said. But those commitments were being analysed "line by line" she said, adding: "British taxpayer wouldn't expect its government to do anything else." There are whispers that Theresa May has privately reassured the other leaders that she is willing to put a lot more than the implicit 20 billion euros (£17.8bn) on the table as we leave. Number 10 doesn't deny this, Mrs May didn't deny it when we asked her in the press conference today, nor did she reject the idea that the bill could be as high as 60 billion euros. If she has actually given those private reassurances though, there's not much evidence the other EU leaders believe her or think it's enough. But if she is to make that case more forcefully she has big political problems at home. She said the two sides were within "touching distance" of a deal on other issues - particularly on citizens' rights. "I am ambitious and positive for Britain's future and for these negotiations but I know we still have some way to go," she said. The UK is due to leave the EU in March 2019, following last year's referendum result. It had hoped to move onto phase two of negotiations - covering future trade arrangements - after this week's summit. But EU leaders took just 90 seconds to officially conclude that not enough progress has been made on the issues of citizens' rights, the UK's financial obligation and the border in Northern Ireland, but "internal preparations" would begin for phase two. The prime minister made a personal appeal to her 27 EU counterparts at a working dinner on Thursday night, telling them that "we must work together to get to an outcome that we can stand behind and defend to our people". BBC Europe editor Katya Adler said all EU leaders knew Mrs May was in a politically difficult situation and did not want her to go home empty-handed, so had promised they would start talking about trade and transition deals among themselves, as early as Monday. German Chancellor Angela Merkel said there were "encouraging" signs of progress in Brexit negotiations and the process was progressing "step by step". And European Commission President Jean-Claude Juncker said he hoped it would be possible to reach a "fair deal" with Britain. "Our working assumption is not the 'no-deal' scenario. I hate the 'no-deal' scenario. I don't know what that means," he said. Brexit: What is at stake in EU-UK talks?